Home / Journal / Where are your happy places? We’ve all got them I guess, those special places that make us feel whole. Somewhere where we just feel right; the most authentic version of ourselves. Where we feel at home. It could be the vista from a hilltop, a bench in a churchyard, your favourite beach on a summers day. Maybe it’s the view from your seat at your local sports team, the park where you met your first love, or the fields that were the background to your childhood. 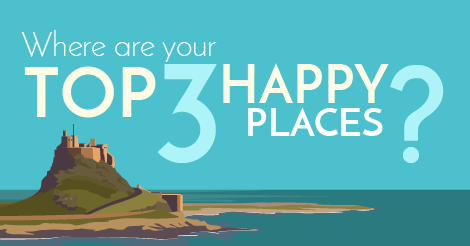 Whether your happy place is a well known landmark or a little known park bench I’d love to hear about it. I’m hoping to get to know what’s important to us all, what makes us all tick. It’s hard to pick a top 3 of anything but just give it a go, it’s not set it stone, you can always change your mind. You never know if I get some good ideas you might just see one of your happy places appear as a travel poster one day.